Time Travel Isn't Possible ... or Is It? The speed at which you move through space determines the speed at which you move through time. Special relativity teaches us that the three dimensions of space and the solitary dimension of time are woven together like a fabric. It's impossible to think of them as separate entities, only a singular unified entity — space-time. We can't think of motion through space without being mindful of motion through time, and vice versa. Left-right, up-down, back-forth and past-future are all on equal footing. Oddly enough, the answer is yes! We cannot avoid moving into our futures, but we can control the rate that we move through time. This is a consequence of another lesson from relativity: Not all clocks are the same. The speed at which you move through space determines the speed at which you move through time. In the succinct phrase: Moving clocks run slow. IF you could build a big enough rocket (don't ask me how, that's an engineering problem) to provide a constant acceleration of 1g (9.8 meters per second per second; the same acceleration as provided by the Earth's gravity at its surface), you could reach the center of the Milky Way galaxy — a healthy 20,000 light-years away — in just a couple decades of your personal time. You could stop for a few hours, have a picnic near Sagittarius A* (the black hole at the center of the galaxy), and then hop back in to your rocket and come back to Earth. By the time you return you'll be eligible for retirement benefits, if the institution providing those benefits is even around, because while you only traveled for a few decades according to the clock on your ship, about 40,000 years would've passed on the Earth. Time is relative, but it still flows in the same direction for everyone. To ask if we can go into reverse is the domain of general relativity (GR) — this is the mathematical language we use to not only understand gravity, but the full connection between space-time and motion. In GR, we ask a slightly more technical question: Is there any arrangement of matter and energy (the stuff that warps space-time) to permit the existence of closed time-like curves, or CTCs? I know this is jargon but it's a fun phrase to toss around at parties. "Curve" here means a path, "time-like" means you never go faster than the speed of light, and "closed" means it returns to its starting point — in other words, its own past. So, Oracle of Einstein, are CTCs permitted? Yes! Well…. There are about half a dozen known configurations of space-time that allow CTCs, or time travel into the past. For example, Kurt Gödel (of Gödel's Incompleteness Theorem fame) discovered that if the expansion of the universe was accelerating (which it is) and the universe is also rotating, CTCs would be allowed and we could travel into our past on a whim. As far as I can tell, Gödel used this solution to point out to Albert Einstein that perhaps GR wasn't all it was cracked up to be — I mean, come on, shouldn't any self-respecting theory of the natural world avoid such an obviously absurd solution? But Gödel's point was moot — all observations indicate that the universe is not rotating, so that particular solution does not apply to our universe, and time travel into the past is verboten. Ah! But what if we were to construct an infinitely long massive cylinder and set it spinning on its axis near the speed of light. It would drag on space-time around it, and certain paths around that spinning cylinder would end up in their own past. Good thing there are no infinitely long massive cylinders in the universe, or we might have to worry. 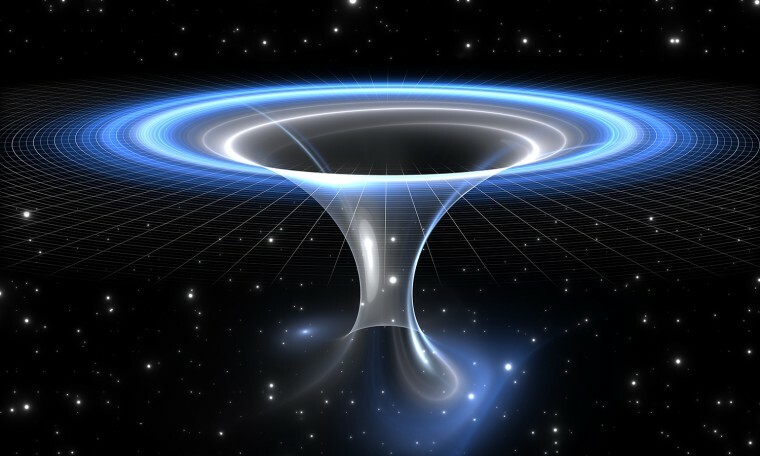 Wait, I've got one: If you make a wormhole (a shortcut between two distant locations in space-time) and send one end racing off near the speed of light and bring it back, the normal time-dilation effects would put one end in the "future" of the other, so you could waltz right through the wormhole throat and end up in your past. What's that? Wormholes require "negative mass" to exist, and negative mass does not exist in the universe? Well, hmm. It's the same story every time (pardon the too-hard-to-resist pun). For every scenario we concoct in general relativity to allow CTCs and time travel into our own past, nature finds a way to confound our plans and rule out the scenario. What's going on? General relativity allows — in principle — time travel into the past, but it appears to be ruled out in every case. It seems like something funny is afoot, that there ought to be some fundamental rule to disallow time travel. But there isn't one. We can't point to any particle interaction at the subatomic level that clearly prevents the formation of CTCs. The inevitable progression of time from the past to the future resembles another indomitable law of nature: entropy. That's the iron law of thermodynamics that states that closed systems go from ordered to disordered. (This law explains why an egg will never just happen to unscramble itself if you leave it alone long enough). Is time linked to entropy? Maybe, but that's the subject of another article…. This story was originally published on Space.com.